Up-Down Enders are designed to turn loads through 90º and typically hold gross weights of 16 tonnes, though this can be increased. 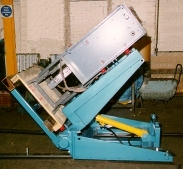 As you can see in the animation to the left, a Lodematic Up-Down Ender enables the load the operator is working on to be turned through 90º, so that they are able to work on more than one face of the load. Up-Down Enders are also adaptable and can be situated on turntable devices. This enables the operator to swivel the load and increase the access and number of sides to be worked on. The Up-Down Ender is commonly used in assembly production, either at the beginning or part way through the line. It is also commonly used to hold a load whilst being transferred from one pallet to another. For example whin the food industry a wooden pallet will have to be exchanged for a plastic pallet before entering a food production facility. Lodematic Handling Systems have supplied Up-Down Enders to various manufacturing sectors and material handling materials including Paper, Film Reels, Steel Coils, Cabinets, Moulding tools and Board Stacks in the UK, Russia and Nepal.